It has definitely been a "Red October" on my boat this month. My redfish patterns have not changed since early September and I keep hitting them hard every week. A transitional pattern has set in and seems to be putting everything on hold for the time being. The fish still have not begun their fall pattern and until they do fishing is going to be fair to good but not great. 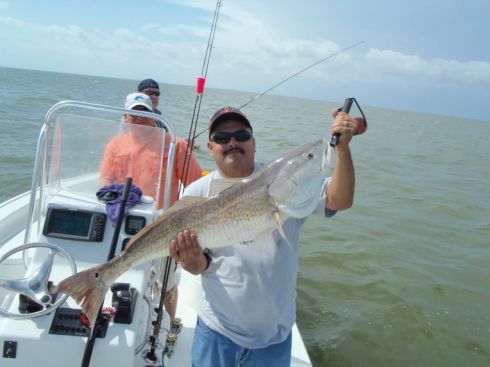 The redfish bite continues to be strong in every area of the Galveston bay system. Continued reports from the beachfront and jetties are that the bull red run is in full effect. The concrete ship and the jetties are two of my favorite bull red spots that produce year after year. A half of a blue crab is as good as it gets for bait but they will hit anything from shad to shrimp to cut mullet and even piggy perch. The wells in Trinity Bay are producing a lot of reds and I am getting reports of plenty of redfish in East Bay & West Bay also. The HL&P spillway in upper Trinity is loaded with small reds. A freelined shrimp or shad with a split shot on it will be met with a some type of guaranteed tug on a line from a variety of species up there. My redfish pattern has been best on a falling tide. Shallower flats in 3-4 ft of water over areas of pipelines and heavy shell seem to be most productive up in the San Jacinto river. Midcoast popping corks (Evolution) with 24-30 inches of 30 lb leader is my set up. A kahle hook or treble will both work for live bait. TTF KFM XL's, spinnerbaits and Gulps under corks will all work very well if you like throwing artificials. 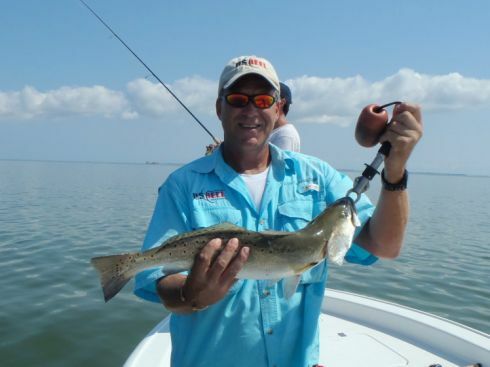 The Speckled trout are a different story. Summer just doesn't want to leave and this has us still holding in a transitional pattern. Mother nature will not let the mid 80's go and the speckled trout think it is still September. So wherever you were catching them in September then they are probably still there. A big drop in water levels is needed so that we can flush the shrimp out of the marshes and that will get the birds working in Trinity and kick that speckled trout bite in to gear. The clam reefs in Upper Trinity are holding lots of fish along with the oyster reefs in East Bay. The San Jacointo river only has a few trout in it and West Bay hasn't turned on just yet but there are a few trout starting to show up in deeper areas over heavy shell. 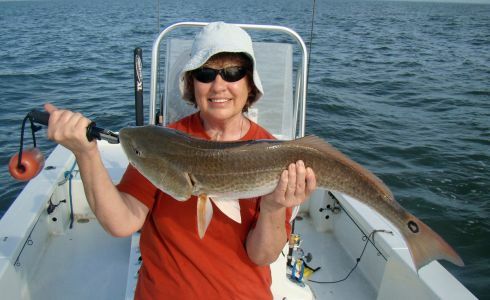 The wells in Trinity are still holding specks and lots of redfish. The bull reds are starting to show up also in that upper bay system but I havent seen any real bird activity to speak of. 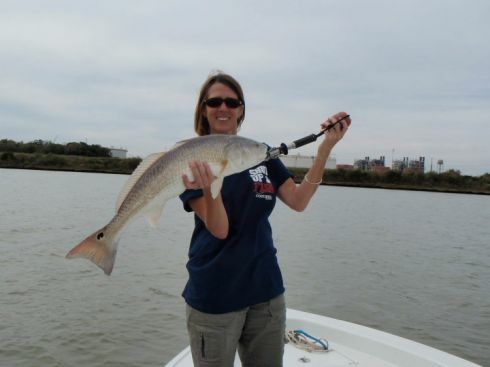 Every week the redfish just seem to get bigger in that lower Trinity/ship channel area. Right now I am throwing dark colors and catching most of our fish on TTF Killer Flats Minnows or Hackberry Hustlers. 1/4 & 3/8 oz jig heads have been working well on the well pads. Of course when using live bait a Midcoast cork with a 30lb leader is my go to set up on every trip. Don't forget to experiment some with the length of your leader when throwing popping corks. I will sometimes use a longer leader in the 50-60 inch range on windier days. Definitely use a split shot to keep that bait down in the water column especially when using a longer leader. 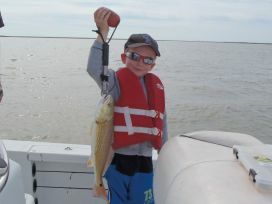 East Bay has continued to produce fish drifting the major reefs with artificials and live bait. I have only run a few trips in East Bay this month but we had a blast over there chasing birds and drifting over heavy shell in deep water. The North shoreline continues to produce lots of smaller fish in large schools usually found by bird activity. Afternoon outgoing tides are best. Do not pass up a group of birds sitting on the water because it can be just as good as seeing working birds in the air. Typically the seagulls are sitting right on top of the fish so break that trolling motor out and slowly work your way over to them until you are within casting distance. Fishing the birds is an art and paying attention to the school and its movements are critical. As conditions improve and we move in to a fall pattern look for that east end to turn on. 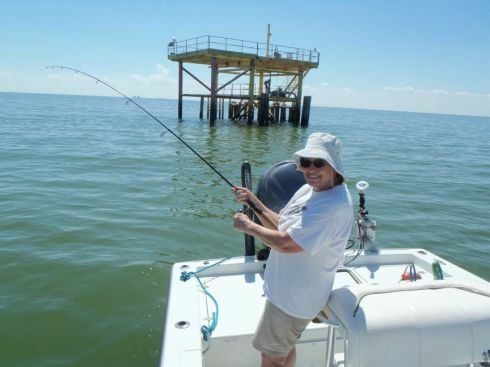 Wadefishermen are beginning their preparations for the colder weather and trophy trout fishing which usually occurs all winter long over deep mud in areas like "The Refuge" (Anahuac Natl Wildlife Refuge), Robinsons bayou, Blacks Cove and Rollover pass. West Bay is finally starting to come to life as water temps are hovering in the mid 70's. 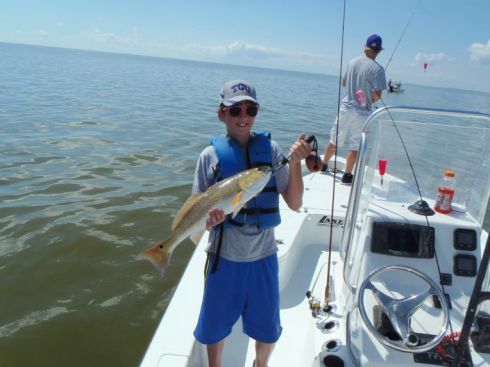 Redfish have been steady in West Bay all year long and they continue to be the best bite over there. Slicks over heavy shell in 4-6 ft of water will give away hungry predator fish to target. The back lakes are holding redfish along the shorelines and early mornings and late afternoons are key times to catch them when they are very agressive and easy to see. Drifting or trolling along shorelines or reefs in the back lakes throwing spinnerbaits, gold spoons or corks will almost always find a hungry redfish. 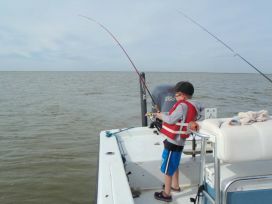 Deeper holes in the back of Greens Lake are perfect spots for anchoring up and loading the boat up with sand trout, puppy drum and croakers.